GSM, EDGE and LTE Interworking. This presentation available to download from here. The 'LTE Signaling' is a very interesting book just being released that is a must have for people who are involved in design, development and testing. A book that explains the basic concepts from beginning till advanced concepts and explains how different components and interfaces fit together. Though I havent yet read this book, I have read the earlier one titled UMTS Signaling, from the same authors that is an excellent reference for understanding Signalling in UMTS. I have no doubt that this book will be the same high quality. The Excerpt on Wiley's website provides complete chapter 1 which is quite detailed and the Packet flow pictures and details below is extracted from this book. 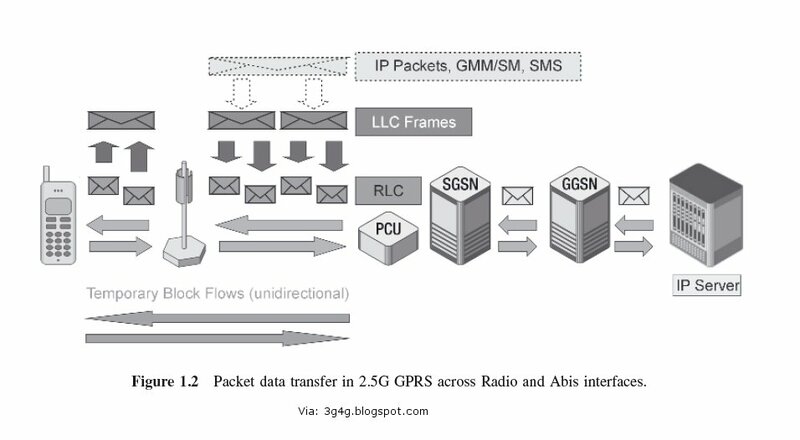 The first stage of the General Packet Radio Service (GPRS), that is often referred to as the 2.5G network, was deployed in live networks starting after the year 2000. It was basically a system that offered a model of how radio resources (in this case, GSM time slots) that had not been used by Circuit Switched (CS) voice calls could be used for data transmission and, hence, profitability of the network could be enhanced. At the beginning there was no pre-emption for PS (Packet Switched) services, which meant that the packet data needed to wait to be transmitted until CS calls had been finished. 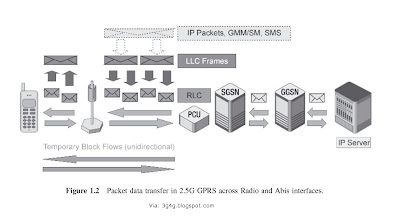 In contrast to the GSM CS calls that had a Dedicated Traffic Channel (DTCH) assigned on the radio interface, the PS data had no access to dedicated radio resources and PS signaling, and the payload was transmitted in unidirectional Temporary Block Flows (TBFs) as shown in Figure 1.2. 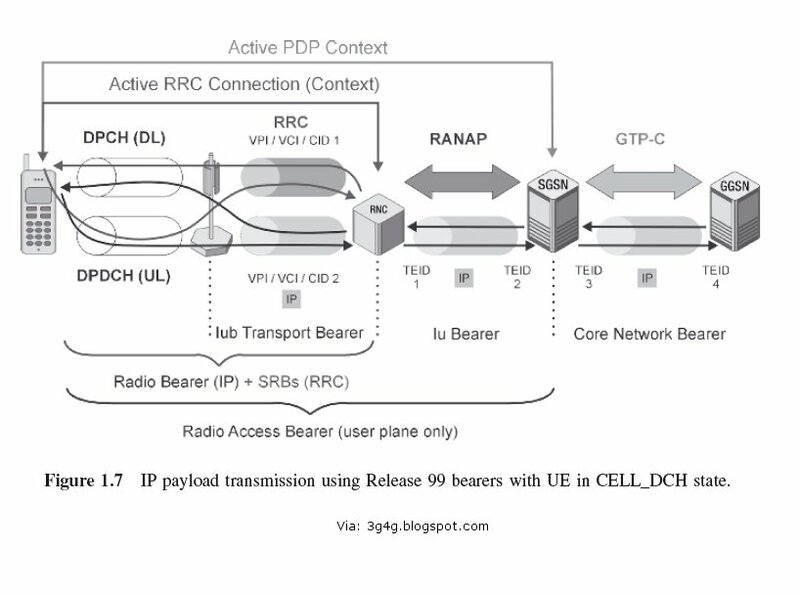 In Release 99, when a PDP (Packet Data Protocol) context is activated the UE is ordered by the RNC (Radio Network Controller) to enter the Radio Resource Control (RRC) CELL_DCH state. Dedicated resources are assigned by the Serving Radio Network Controller (SRNC): these are the dedicated physical channels established on the radio interface. Those channels are used for transmission of both IP payload and RRC signaling – see Figure 1.7. RRC signaling includes the exchange of Non-Access Stratum (NAS) messages between the UE and SGSN. The spreading factor of the radio bearer (as the combination of several physical transport resources on the Air and Iub interfaces is called) depends on the expected UL/DL IP throughput. The expected data transfer rate can be found in the RANAP (Radio Access Network Application Part) part of the Radio Access Bearer (RAB) assignment request message that is used to establish the Iu bearer, a GPRS Tunneling Protocol (GTP) tunnel for transmission of a IP payload on the IuPS interface between SRNC and SGSN. 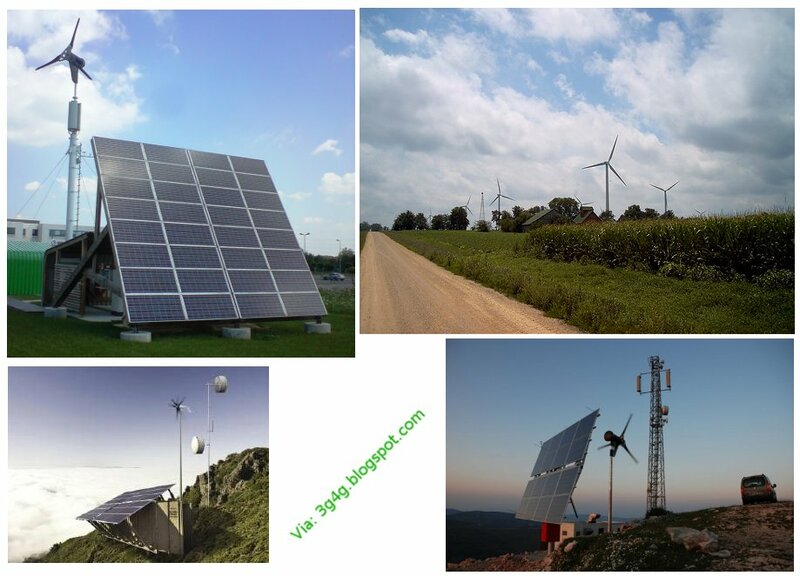 While the spreading factor controls the bandwidth of the radio connection, a sophisticated power control algorithm guarantees the necessary quality of the radio transmission. For instance, this power control ensures that the number of retransmitted frames does not exceed a certain critical threshold. Activation of PDP context results also in the establishment of another GTP tunnel on the Gn interface between SGSN and GGSN. In contrast to IuPS, where tunnel management is a task of RANAP, on the Gn interface – as in (E)GPRS – the GPRS Tunneling Protocol – Control (GTP-C) is responsible for context (or tunnel) activation, modification, and deletion. However, in Release 99 the maximum possible bit rate is still limited to 384 kbps for a single connection and, more dramatically, the number of users per cell that can be served by this highest possible bit rate is very limited (only four simultaneous 384 kbps connections per cell are possible on the DL due to the shortness of DL spreading codes). To increase the maximum possible bit rate per cell as well as for the individual user, HSPA was defined in Releases 5 and 6 of 3GPP. In High-Speed Downlink Packet Access (HSDPA) the High-Speed Downlink Shared Channel (HSDSCH) which bundles several High-Speed Physical Downlink Shared Channels (HS-PDSCHs) is used by several UEs simultaneously – that is why it is called a shared channel. A single UE using HSDPA works in the RRC CELL_DCH state. For DL payload transport the HSDSCH is used, that is, mapped onto the HS-PDSCH. 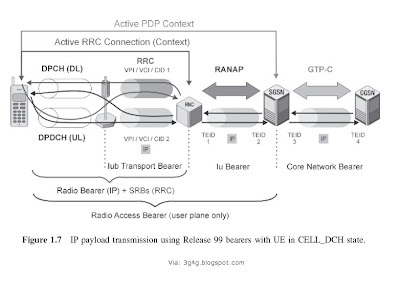 The UL IP payload is still transferred using a dedicated physical data channel (and appropriate Iub transport bearer); in addition, the RRC signaling is exchanged between the UE and RNC using the dedicated channels – see Figure 1.8. All these channels have to be set up and (re)configured during the call. 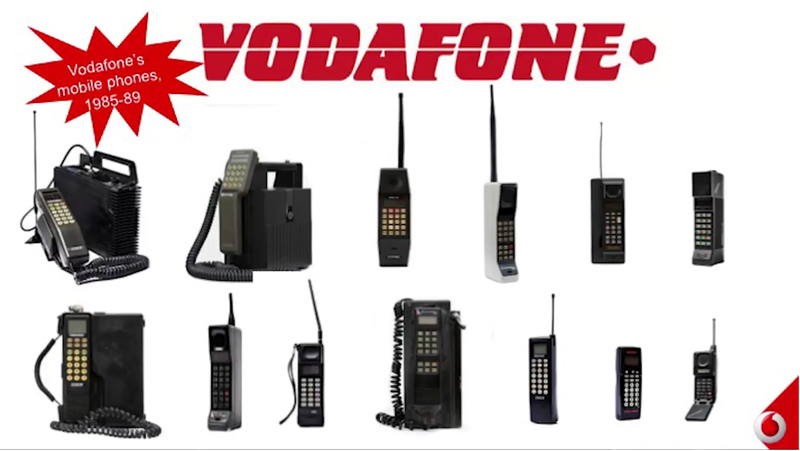 In all these cases both parties of the radio connection, cell and UE, have to be informed about the required changes. While communication between NodeB (cell) and CRNC (Controlling Radio NetworkController) uses NBAP (Node B Application Part), the connection between the UE and SRNC (physically the same RNC unit, but different protocol entity) uses the RRC protocol. The big advantage of using a shared channel is higher efficiency in the usage of available radio resources. There is no limitation due to the availability of codes and the individual data rate assigned to a UE can be adjusted quicker to the real needs. The only limitation is the availability of processing resources (represented by channel card elements) and buffer memory in the base station. • reducing the delays and interruptions in user data transfer to a minimum. These are the reasons why LTE has an always-on concept in which the radio bearer is set up immediately when a subscriber is attached to the network. And all radio resources provided to subscribers by the E-UTRAN are shared resources, as shown in Figure 1.9. 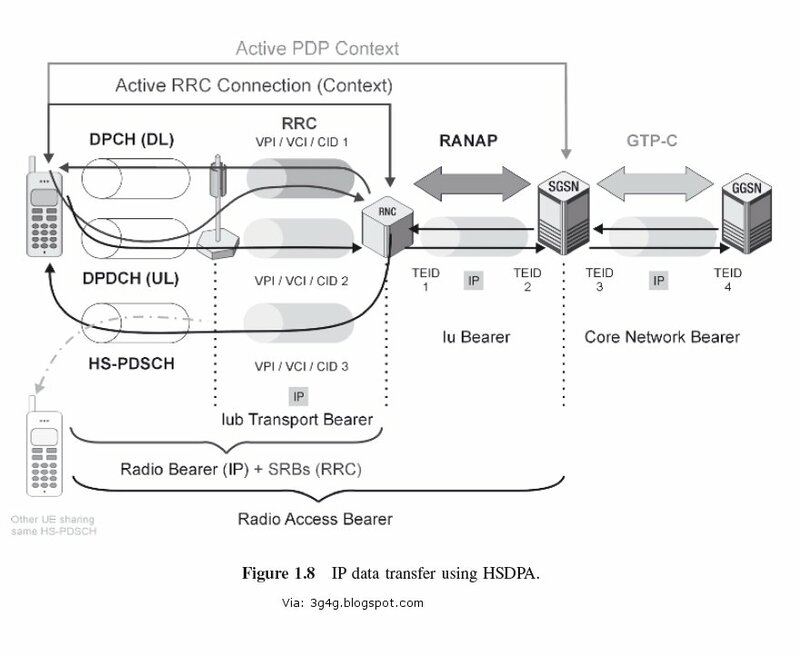 Here it is illustrated that the IP payload as well as RRC and NAS signaling are transmitted on the radio interfaces using unidirectional shared channels, the UL-SCH and the Downlink Shared Channel (DL-SCH). The payload part of this radio connection is called the radio bearer. The radio bearer is the bidirectional point-to-point connection for the user plane between the UE and eNodeB (eNB). The RAB is the user plane connection between the UE and the Serving Gateway (S-GW) and the S5 bearer is the user plane connection between the S-GW and public data network gateway (PDN-GW). 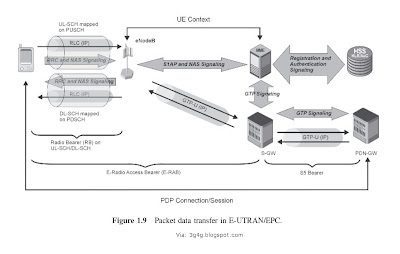 The end-to-end connection between the UE and PDN-GW, that is, the gateway to the IP world outside the operator’s network, is called a PDN connection in the E-UTRAN standard documents and a session in the core network standards. Regardless, the main characteristic of this PDN connection is that the IP payload is transparently tunneled through the core and the radio access network. To control the tunnels and radio resources a set of control plane connections runs in parallel with the payload transport. 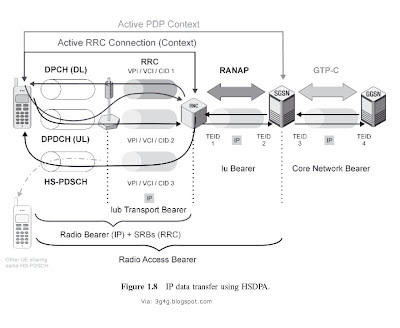 On the radio interface RRC and NAS signaling messages are transmitted using the same shared channels and the same RLC transport layer that is used to transport the IP payload. RRC signaling terminates in the eNB (different from 3G UTRAN where RRC was transparently routed by NodeB to the RNC). The NAS signaling information is – as in 3G UTRAN – simply forwarded to the Mobility Management Entity (MME) and/or UE by the eNB. You can read in detail about all these things and much more from the Wiley's website here. EDGE is more than three times as efficient as GSM/GPRS in handling packet-switched data. Using EDGE, operators can support 3x more subscribers than GPRS, either by increasing the data rate per subscriber to 300 kbps, according to network & device capabilities, or adding voice capacity. 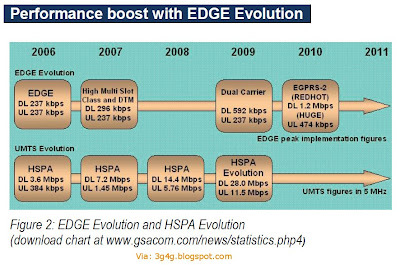 EDGE uses the same TDMA frame structure, logic channel and 200 kHz carrier as GSM; existing cell plans remain intact. No change is needed in the core network. Neither new spectrum nor a new operating licence is needed. EDGE is a mature, mainstream global technology which allows operators to compete, to protect investments/assets, and stimulate growth of mobile multimedia services. Upgrading to EDGE is a natural step for operators to offer high performance mobile data services over GSM. 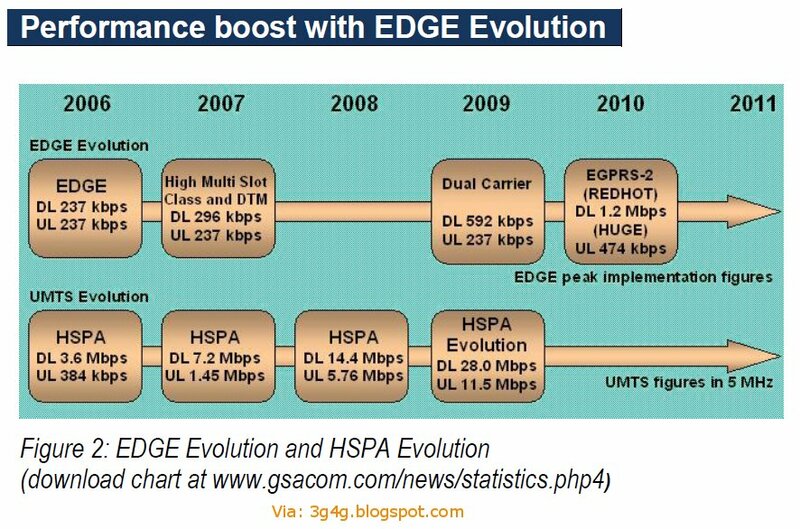 The performance of EDGE has improved steadily since its introduction in the market in 2003, and today offers users the possibility of data speeds up to 250kbps, with a latency of less than 150ms. This is sufficient for any current data service to be attractive to customers. According to GSA’s latest EDGE Fact Sheet (August 19, 2010 and available as a free download from www.gsacom.com) over 80% of GSM/GPRS operators globally have committed to deploying EDGE in their networks. 531 GSM/EDGE networks are in commercial service in 196 countries, and thousands of EDGE-capable user devices are launched. A key part of the evolution is the opportunity to deploy more than a single RF carrier. Downlink Dual Carrier (DLDC) is the first step in evolving EDGE, doubling data rates to 592 kbps on existing EDGE-capable networks. The EGPRS-2 feature is expected in the market in 2012. 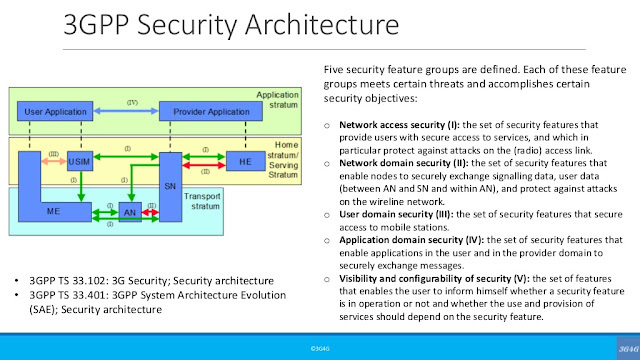 More information is available in the GSA Report 'EDGE Evolution' released on Aug 23 2010. Available to download from GSACOM here.